Once I set my mind to something I am committed. Whether it is my favorite article of clothing (overalls,) my favorite food (cheese) or my favorite man (Snoopy) there is no changing my mind. I got my first pair of overalls sometime in preschool. I can remember ordering bowls of grated cheese as my meal at Anita’s Mexican restaurant as a little kid. And Snoopy and I have been in love for as long as I can recall. I left my first Snoopy in the Smithsonian Museum cafeteria circa 1981 and my mom promptly replaced him. The “new” Snoopy was de-stuffed and washed multiple times before he was satisfactory. There is a certain neck flop that I demand from my Snoopy. She very kindly obliged. By the time I went away to college there was no questioning whether or not Snoopy would be tagging along. At that point Snoopy 2.0 was coming up on 15 years of age. He’d had a near total removal of his neck over the years, sewing up one hole at a time. Until his head sits right atop his body. But the crucial parts are still in full effect. I started sleeping on my side when I was 8 or 9. A broken arm introduced me to the joy of side sleeping with a pillow. What began as a propped up cast developed in to a life long love of side sleeping and spooning a spare pillow. And my Snoopy. The right side of his face is softer than the left. His right ear even softer than that. Years and years of my thumb smoothing his hair down has made his ear in to a Snoopy shaped worry stone. I didn’t set out to do it. When we decorated our bedroom. It was my first adult bedroom with all new furniture and bedding, chosen by myself and my husband. Thirty four years old. 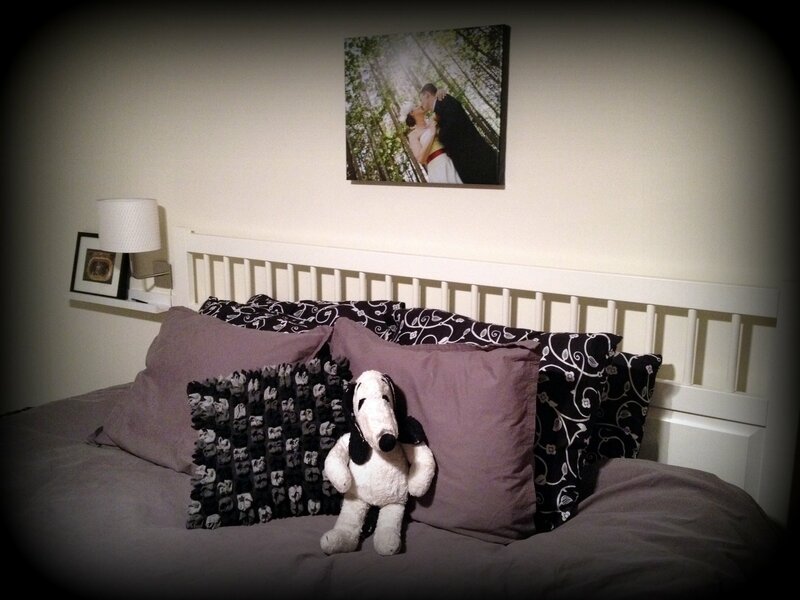 I got MQD a wedding picture on canvas for above our bed. We opted to keep things very clean and simple. Black. And White. And Grey. He’s not crazy about the throw pillow I picked out for the center of our bed. But who am I kidding? 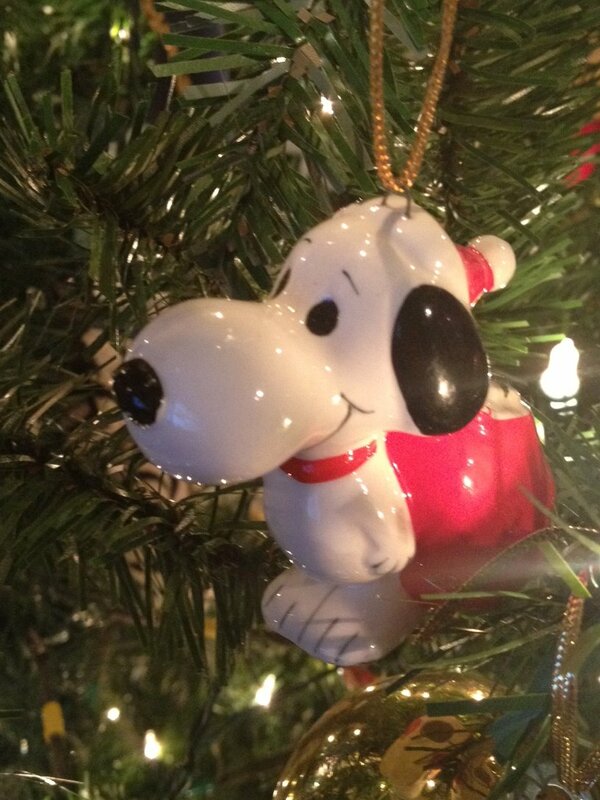 It’s Snoopy that sits center stage. He’s coming up on 31 years of service, I think. He can sit wherever he wants. 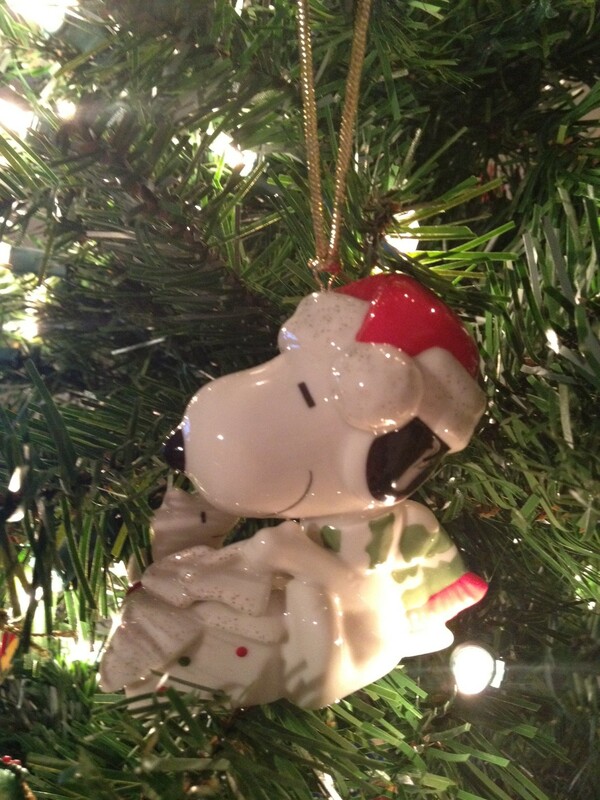 This entry was posted in Family, Parenting and tagged Christmas, Decorating, Ornament, Snoopy. Bookmark the permalink. My night time buddy was a Humpty Dumpty. Wish I could have found one for the kids. Ha!! I’d forgotten that we share that in common.